Visit us at booth# S4559! ProMat 2019 is the premier tradeshow for manufacturing, supply chain, and distribution. 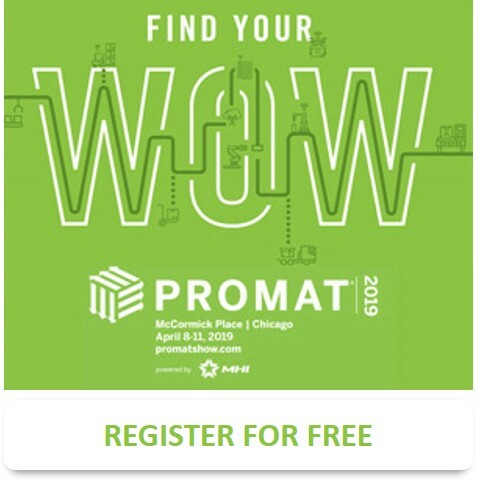 At ProMat you can Find Your Wow. Whatever the game-changer you’re looking for, you’ll find it at this show. ProMat is where manufacturing and supply chain professionals come together to find their supply chain WOW – that trend, technology, or solution that will take their supply chain to the next level of success. As always we have your VIP free registration to ProMat. Just click this link or the image to the left and you’ll be taken to the registration page. Adrian’s will be showcasing our one-of-a-kind Rack Safety Straps and unique Rack Safety Nets (safety netting) on pallet racks so you can test them out yourself. We will also be available to discuss your specific application and custom needs.